Paddy Rice, the Irish sports bar on the river front in Phnom Penh, just rolled out a new look. The bar opened about 8 months ago. The first site was done in a bit of a hurry. Now, with a few months of life (and content) behind them, the redesign seems more substantial and focused. Orange and green are the colors of the Irish flag. 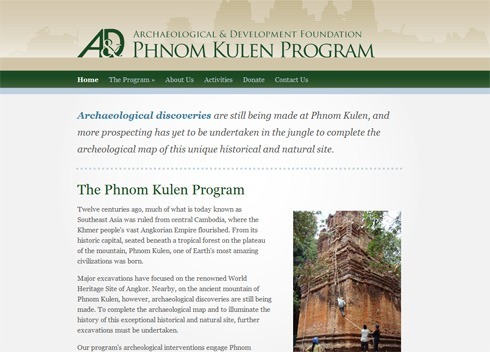 The Phnom Kulen Program Web site is the latestÂ release from K4 Media. Still in beta, we put the small, 8-page site out to members of the program and the Google alt.html.critique group (here). The html.critique group is an excellent place to get honest, unabashed feedback on work. The comments can sometimes bruise the ego, but the sites are always the better because of it. Of course, feedback — both good and bad — is always welcome. If you see something you like, or don’t,we’d love to hear it. After getting feedback, and making changes accordingly, The Phnom Kulen Program site is scheduled for launch by month’s end.